Financing of small and medium-sized enterprises (SMEs) today is one of the major areas of state support in volatile economies, as it is recognized as the most pressing problem affecting the activities of small businesses. The scale of development of SMEs in Russia today and its contribution to the economic recovery is clearly insufficient and impossible to expand without special measures of state support. This chapter will analyze the current state, dynamics, and financial constraints of SMEs in Russia; classify state supporting institutions; suggest basic methods to curb the situation; and disclose prospective financial supporting tools for SMEs development. The authors established the possibility of applying the Russian experience in supporting SMEs in the Republic of Ghana. This is due to the similarities in economic issues in these countries such as depreciation of currency and fall in oil prices. The authors analyzed the volumes and results of major government activities of the Russian Federal State and identified prospects for their development and implementation in Ghana. This topic was chosen because of the insufficient contribution of small business to the economy of Russia. This seems to be a common problem for most emerging countries with volatile economies. Few researchers including (Wang, 2016), (Shinozaki, 2012), (Khan & Khalique, 2014), (Shevchenko & Ellah, 2018) and (Hussain, 2012) have sought to find out the crucial factors influencing the performance of businesses and how to improve upon them. The known works of classical economic theory are devoted to the problems of entrepreneurship. Keynesianism also talk a lot about the importance of state regulation of small and medium-sized businesses in the national economy. Problems with development of small businesses are well described in the works of some Russian researchers including Vasilevskaya (2016), Mahalina and Mahalin (2016), Parshin (2017), Fateeva (2016) among others. 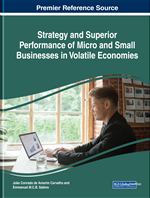 Hence the authors find this topic relevant to the development of financial support to small and medium-sized businesses in volatile economies. Practically there are no known works of researchers on implementation of the Russian experience in other volatile economies. The authors therefore consider it as an opportunity to tap into the Russian expertise in surviving through crisis in the economy of Ghana. Ghana was once ranked the fastest growing economy in the world (Financial Times, 2011). But over the years, the country has plunged into huge debts, fall in oil prices, depreciation of currency among others. These has led to poor performances of the economic indicators. In turn, the authors will discuss possible means to help combat the situation in Ghana adapting the model used by Russia. PJSC: An acronym that stands for public joint stock company. Microfinance: Is a type of banking credit ranging from as little as $100 to about $25000, provided to the unemployed or low-income individuals in order to support the running or establishment of businesses. Sanction: A threatened penalty as a result of not complying to a law or rule. Syndicated Warranty: It is a joint product of the corporation and regional guaranteeing organizations, in which the corporation provides an independent guarantee in favor of the bank in order to ensure the fulfillment of obligations of the subject of small and medium Enterprise under the loan agreement. It involves the conclusion of a quadripartite agreement between the borrower, the bank, the regional guaranteeing organization and the SME Corporation. JSC: An acronym for joint stock company. Subsidy: A benefit or support given to an individual, business, or institution, usually by the government. It is usually in the form of a cash payment or a tax burden reduction. Guarantee: This is characterized by providing direct guarantees in favor of the bank in order to ensure the fulfillment of obligations of the small business entity under the loan agreement. Appreciation: An increase in value of assets over a particular period of time. In this case, the performance of a particular currency against trading currencies are considered as an appreciation. Counter Guarantees: A joint product of small and medium businesses and regional guaranteeing organizations in which the corporation provides an independent guarantee in favor of the bank in order to ensure the fulfillment of obligations of the regional guarantee organizations under surety agreement. Performance Index: It is the matching of ongoing results against set goals.